It's hard to not be concerned with global warming when its effects are right in front of your eyes. Sure, it's one thing when the ocean begins to reclaim islands, but when you can see the effects in your home town, well, that's another story altogether. 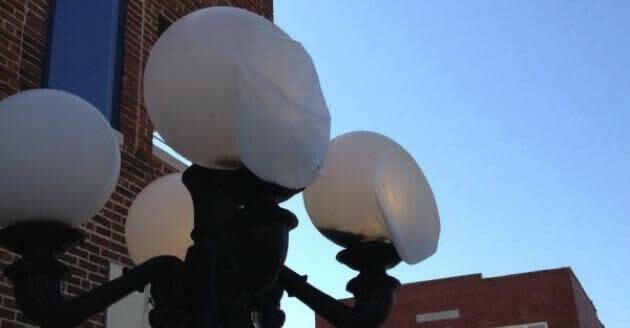 Case in point: KFOR TV in Stillwater, Oklahoma is reporting that temperatures are so high that the street lamps have begun melting. To be sure, Stillwater is suffering from one heck of a heatwave. It's expected to reach 115 there today, 108 on Friday, and 109 on Saturday. And warmer temperatures are nothing new: July represented the 23rd month out of the last 28 that came in warmer than average. It's possible the heat itself isn't responsible for the event — it's being reported on Facebook that a nearby dumpster fire may have been the cause of the melting plastic light housings. Still, that dumpster fire was caused and aggravated by the record heat and dryness. And if dangerous, spontaneous fires aren't reason enough to go green, we don't know what is.